The Los Angeles Rams, who have never gone to a Super Bowl, eliminated one of the major reasons why - the Dallas Cowboys - Sunday in the magical type of comeback the Cowboys thought they had patented. It was third-year quarterback Vince Ferragamo's 50-yard touchdown pass with 2:06 remaining that cooked the Cowboys 21-19 and put Los Angeles in the National Football Conference title game next Sunday on the road against Tampa Bay. The Cowboys appeared to be ready to make their eighth NFC title appearance of the decade. Then Ferragamo, who was third string in training camp, pulled off a Dallas-type "miracle" with his perfectly timed shot to Billy Waddy. "When I dropped back. I saw the deep zone coverage and got the ball behind the linebackers," said Ferragamo. "I had told the team in the huddle that this was our last effort and so please make it a good one. We hung in there and pulled it out." Rams Coach Ray Malavasi, who has seen Dallas knock the Rams out of the playoffs three times since 1973, said, "This is one of the best wins I've ever been around since I've been in football." Malavasi said he concocted a seven defensive back secondary to "match speed with speed. Our defensive coordinator, Bud Carson, came up with idea. It was very effective." Malavasi was still steaming over a fourth-quarter call in which official overruled a pass-interference flag thrown by another that cost the Rams possession deep in Dallas territory. "That was a real bad call, there was interference. Overruling was ridiculous and I'll probably end up getting fined but I don't give a damn." 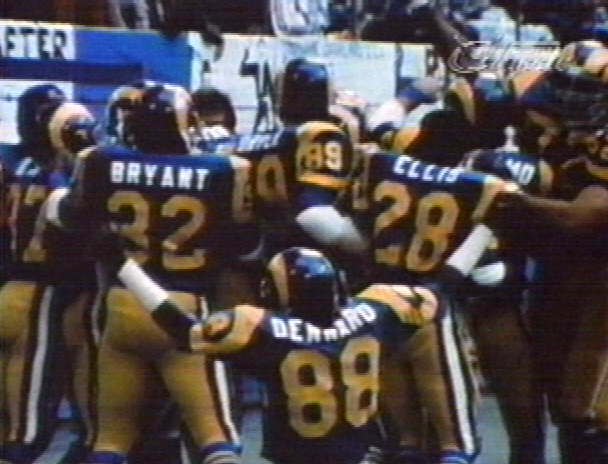 Dallas Coach Tom Landry said, "The Rams played one of their better defensive games. They mixed defenses up on third down and kept us off balance fairly well. He added: "I said before the game everybody has a chance to make it to the Super Bowl because it's that kind of year." Dallas defensive back Larry Cole summed up how his team felt. "All year we let the big plays get away from us, and that's what did us in today." Ferragamo, who had thrown two touchdown passes in the first half, but was burned by two second-half interceptions, stole a page from Roger Staubach's book on last-minute heroics. Waddy ran a post pattern across the middle and snared the pass at the Dallas 27 behind the outstretched hands of two linebackers. He then outran safeties Dennis Thurman and Cliff Harris down the left sideline to score standing up. It hushed the sellout crowd of 64,792.